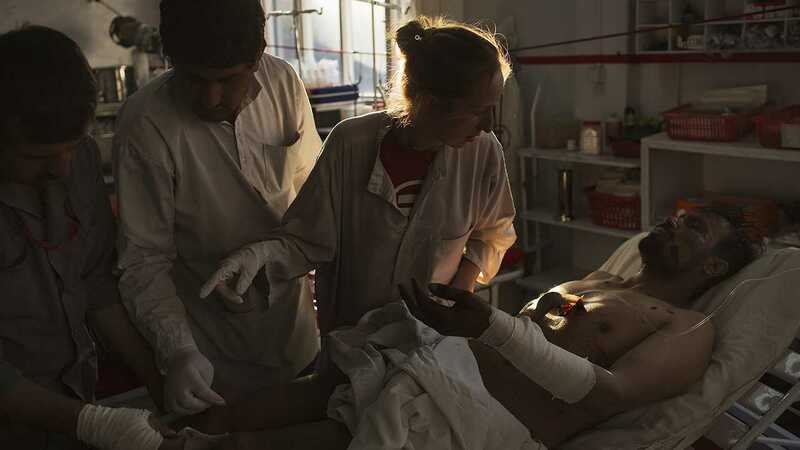 In a small hospital in Kabul, doctors and nurses struggle to keep pace with a rush of civilians wounded in an unrelenting civil war. The following news story contains graphic content. 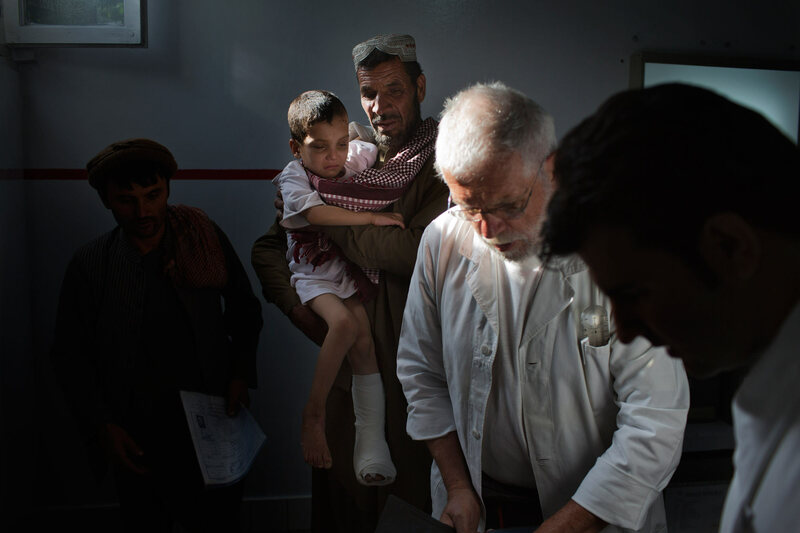 KABUL, Afghanistan – The maimed and dying arrive at the Emergency Surgical Center from across Afghanistan, daily testaments to the civil war’s crumbling humanitarian boundaries. A pregnant woman shot in the face by errant gunfire. 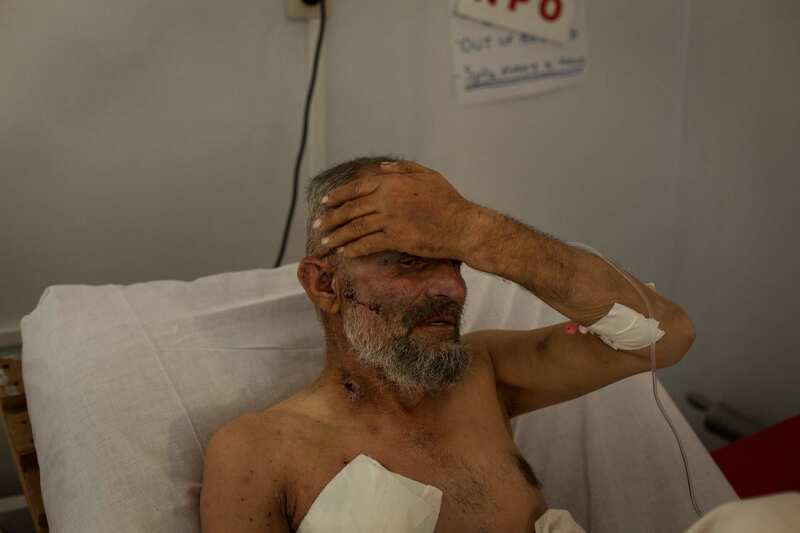 A farmer shattered by a roadside bomb. An elderly man riddled with rifle rounds. Young brothers shredded by shrapnel. Boys and girls ripped apart by rocket propelled grenades. Ordinary people ruined by a conflict that America can’t leave behind. The churn at the converted kindergarten is relentless, the metabolism frenetic. And the climate has never been more dire. 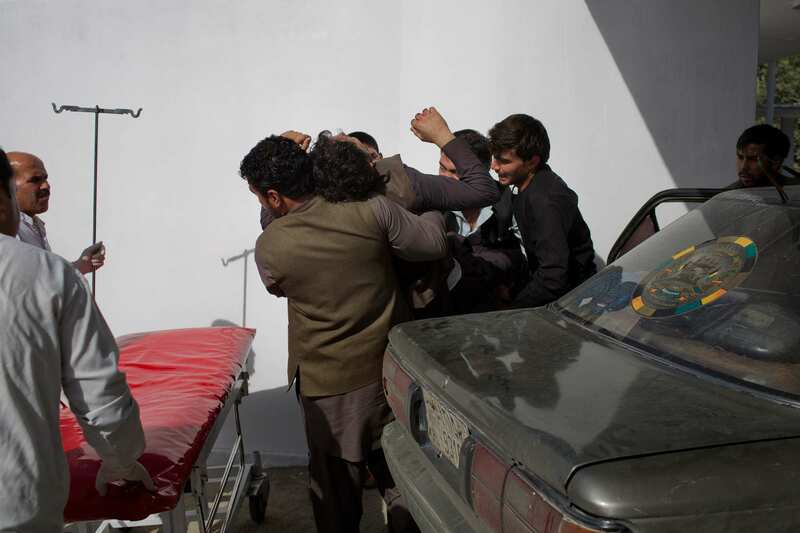 Broken bodies, young and old, churn through the Emergency Surgical Center in Kabul, innocent victims in an escalating civil war. Afghanistan’s civilians are getting injured and killed in greater numbers than any time since the beginning of the U.S.-led war in late 2001, a sign of the country’s unstable future — and America’s dubious legacy there. With the withdrawal of U.S. troops, fighting between the Taliban and government security forces has escalated. Both sides operate under looser rules of engagement: not much is off limits, and they fight more often in the villages and crowded bazaars of the contested countryside. That has drawn more non-combatants — men, women and children —into the violence. Last year, civilian casualties hit their highest number since the United Nations began keeping records six years ago, with 3,545 killed and 7,457 wounded. Casualties among women rose 37 percent, to 1,246, and among children rose 34 percent, to 2,829. The trend continued into 2016, with another increase in combined deaths and injuries among civilians, according to the UN. 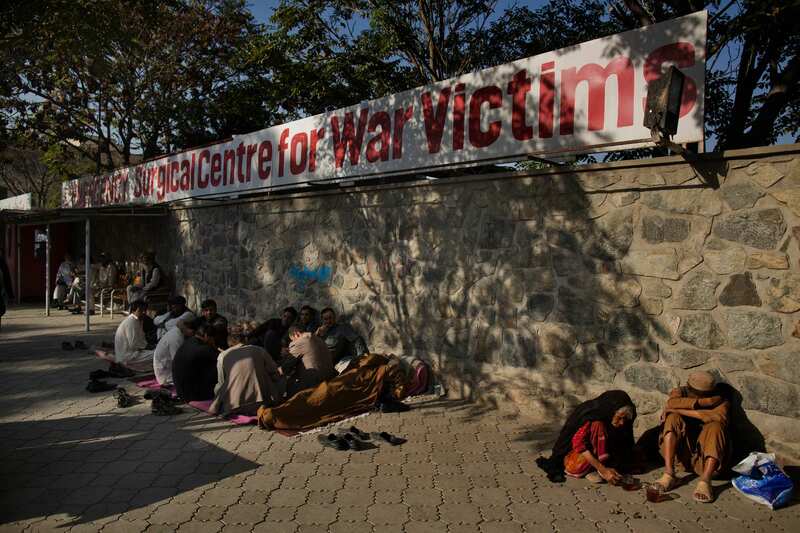 The Emergency Surgical Center in Kabul is where many of them come to heal. Photographer Victor J. 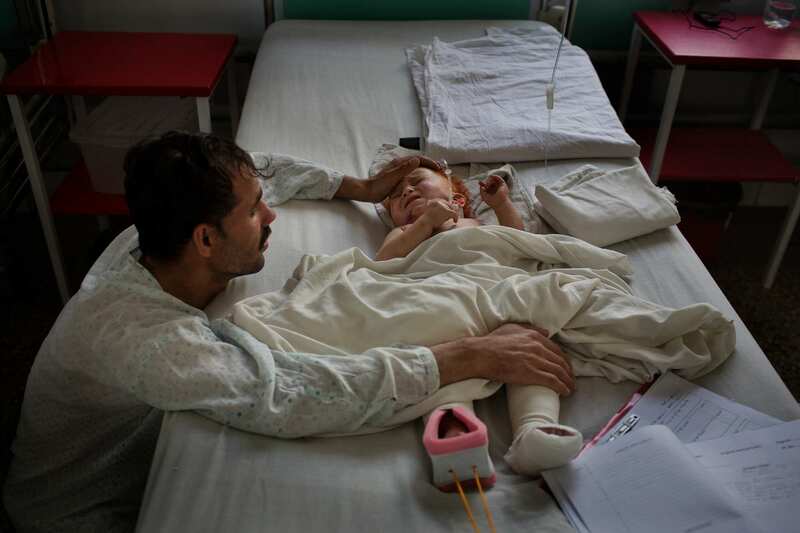 Blue spent two months at the hospital last fall, documenting the latest fighting season’s toll. Some scream. Some weep. Some are unconscious. 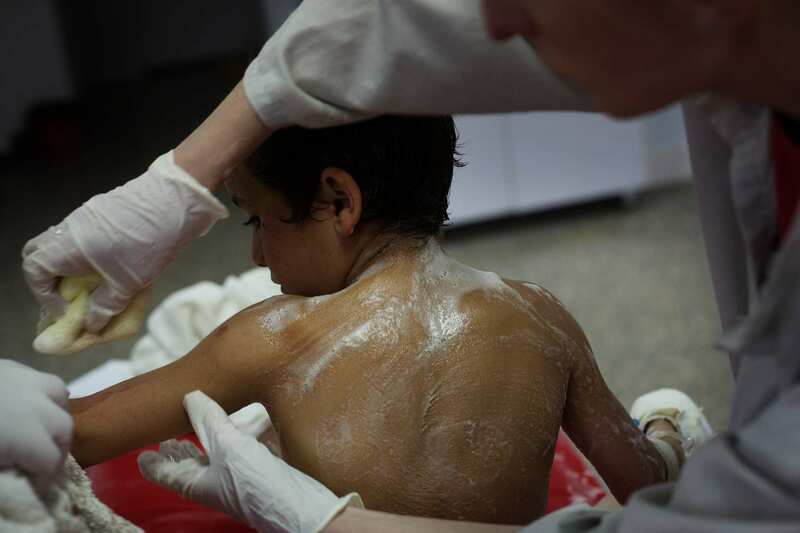 They come by ambulance and taxi, relatives heaving them onto gurneys that carry them into the emergency room, where nurses cut away clothes and pile them in bloodstained heaps as they check pupils, listen for labored breathing and search wounds. Injuries to children are rising as fighting continues near schools, playgrounds and homes. according to the United Nations Assistance Mission in Afghanistan. 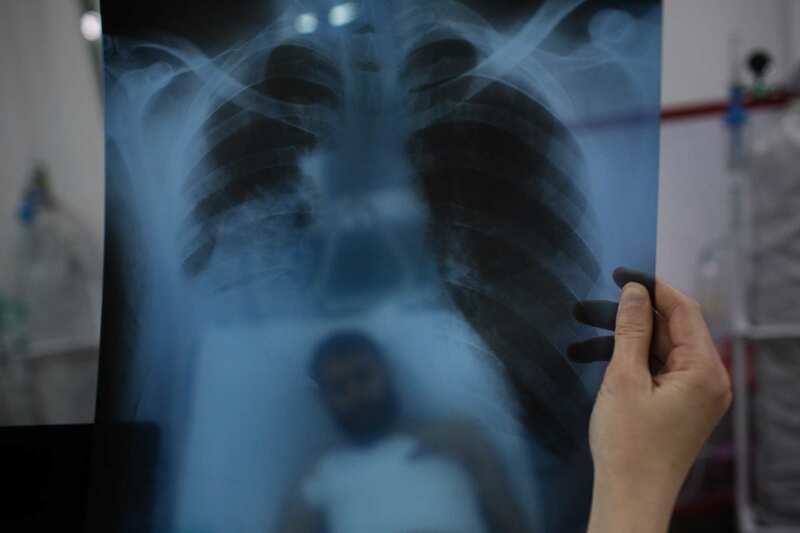 The injuries aren’t hard to diagnose: in most cases, a bullet or shard of hot metal has torn through the bodies, piercing internal organs, breaking bones, destroying limbs. 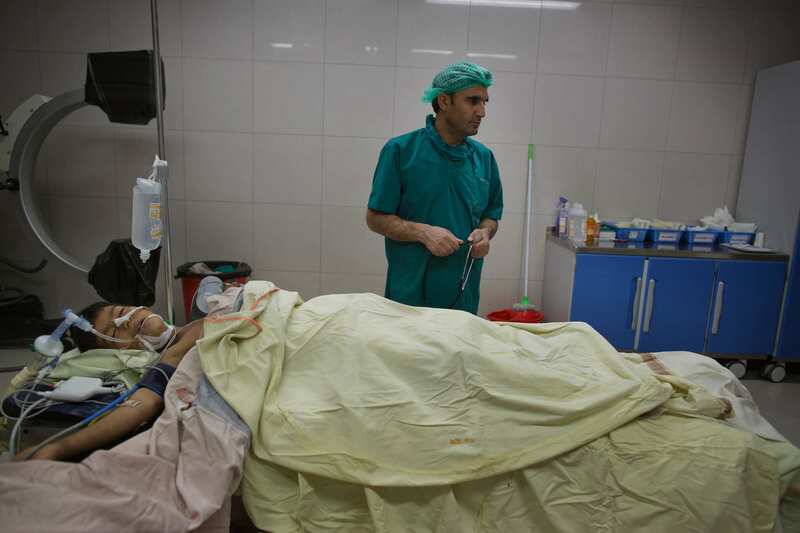 If the wounds aren’t catastrophic, the victims are prepped for surgery. The others are rushed straight to the operating room — no X-ray, no sponge bath, nothing. Go, go, go! 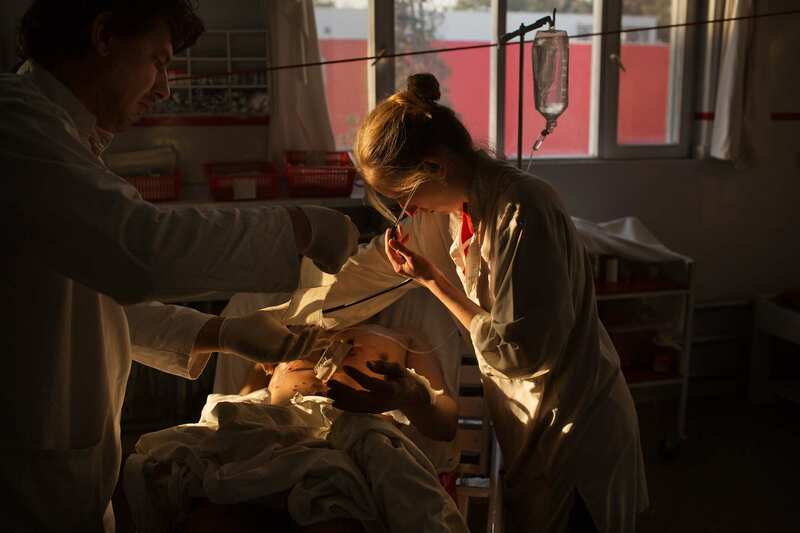 The lucky ones get saved by a committed but exhausted staff of nurses and doctors, Afghans and foreigners, who deliver world-class trauma care with only basic resources. They are preternaturally cool, having seen just about everything war inflicts on the human body. Sometimes, the damage is so great that they are not sure where to begin. That momentary pause is their only outward sign of worry. 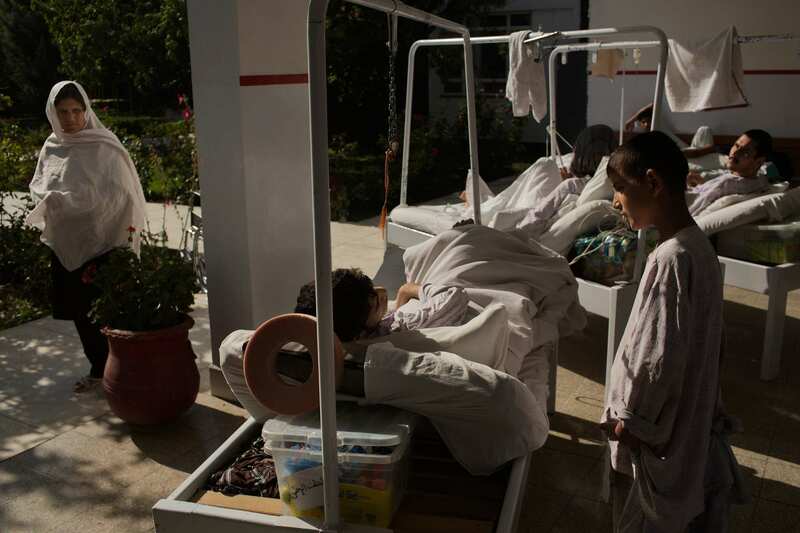 Victims and their families endure epic treks to the Emergency Surgical Center, where staff live in cloistered conditions. Then they get working. They open up the bodies, search through them and fix things, gripping and pulling and cutting and sewing. 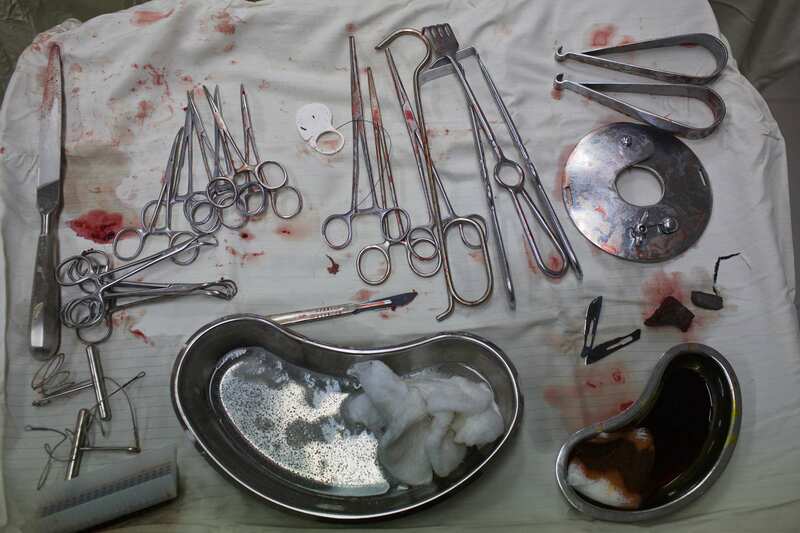 There is no luxury of specialization: when an old man arrives with wounds from six Kalashnikov rounds — broken leg, pierced lung, torn intestines — a single doctor becomes at once an orthopedist, internist and vascular surgeon. One of the most common procedures is a laparotomy: opening the abdomen and lifting out organs for examination. 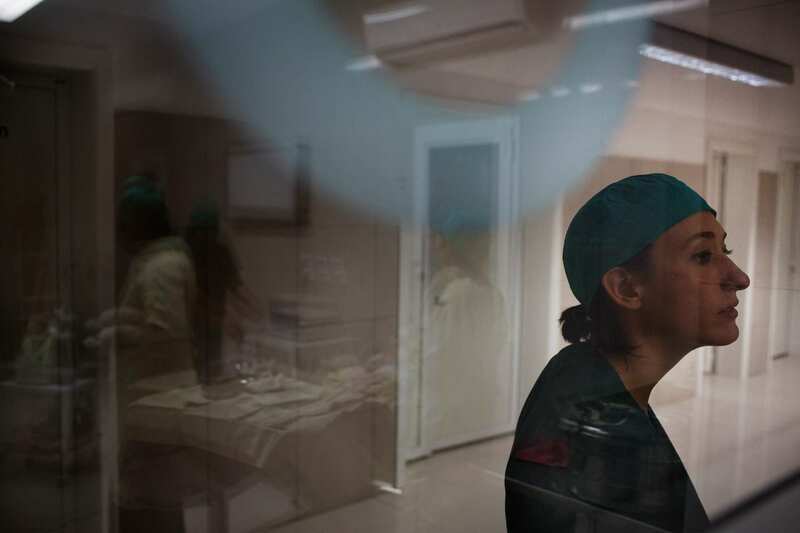 When the damage is repaired, patients are dispatched to the crowded wards, where nurses dart from bed to bed, changing IVs and turning on oxygen tanks and checking vital signs. The atmosphere in the recovery rooms can go from calm to cacophonous in an instant, jolted by a child’s scream. After the emergency surgeries comes the healing — physical and psychological. The broader, long-term impact is catastrophic. 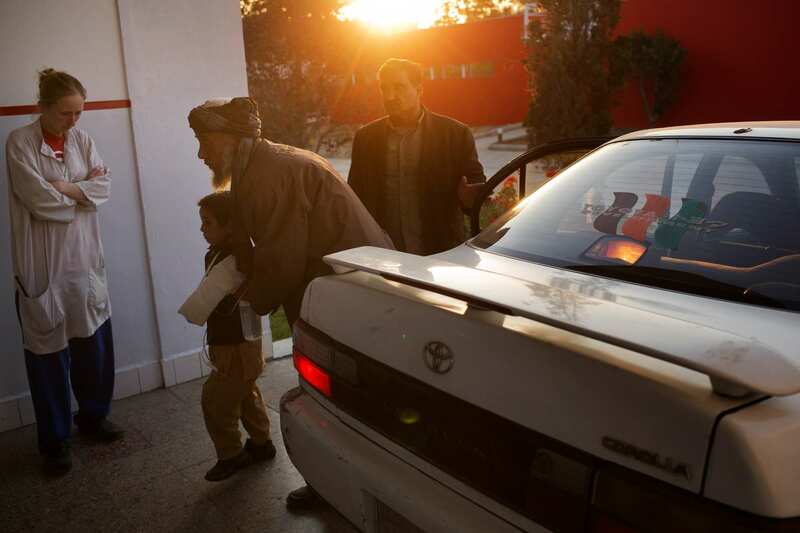 Every day, minivan ambulances and Toyota Corolla taxis ferry wounded through the hospital’s gates in the Shar-i-Now neighborhood of Kabul. This is often the last stop in their epic treks, some lasting many hours, from a constellation of remote villages and towns across the provinces surrounding the capital. Some pass through one of Emergency’s countryside clinics, where they are prepared for the bumpy journey to Kabul. By the time they arrive, the dressings on their wounds are crusted with dried blood. The longer the trip, the greater the risk of death. Between bursts of frenetic activity, there are moments of rest and silent contemplation. 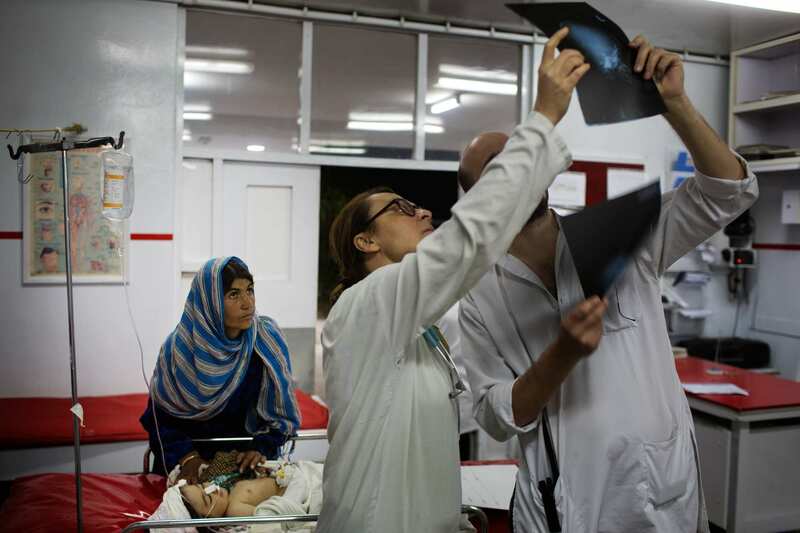 The hospital, run by the Italian medical NGO Emergency, admitted 3,099 war wounded in 2015, an increase of 28 percent over the year before. Admissions continued to increase in the first two months of 2016. 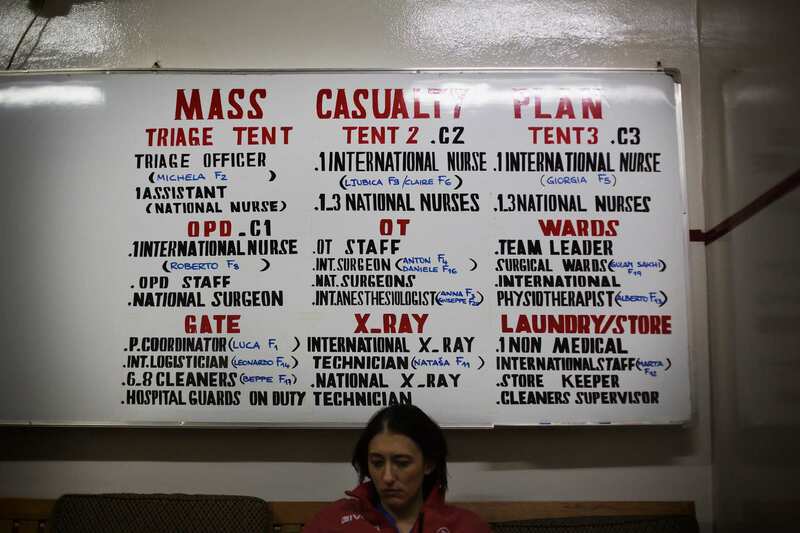 Someday, after Emergency is no longer needed, the agency hopes to leave the hospital to the Afghans. The hospital, several small concrete buildings connected by walkways and protected by a stone wall, maintains some feel of a former school. There is no air conditioning; fans provide the only relief from the midday heat. 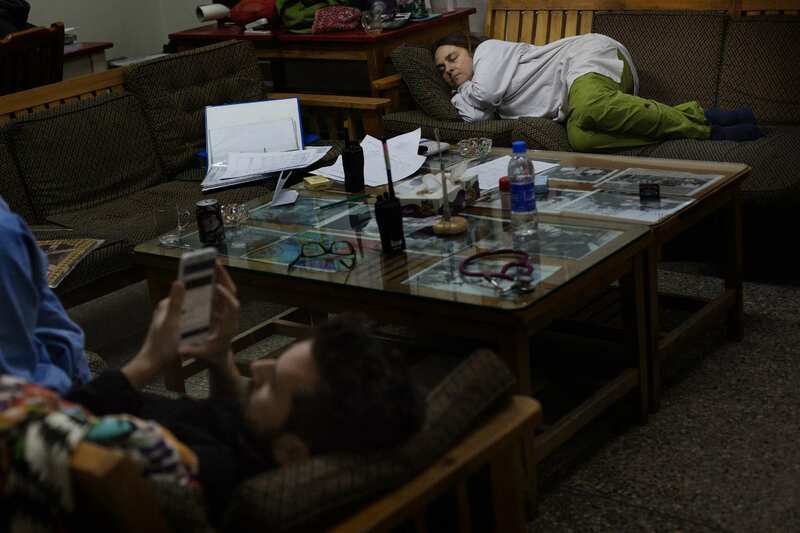 The windows and screen doors stay open all day during the warm months, letting in shouts, honks and sirens from the nearby Kabul streets. The air inside swirls with the scents of bleach, antiseptics, laundry detergent and freshly baked bread. In the late afternoon, the fading sun turns the hospital a golden hue just as activity picks up. Patients who’d been traveling since morning begin to arrive by the carload, bloodied and bandaged. Among the most common injuries seen at Emergency are to curious children who came across unexploded bombs. Then, as night arrives, staff, patients and their families gather to eat and talk in impeccably maintained outdoor gardens that run the length of the hospital. 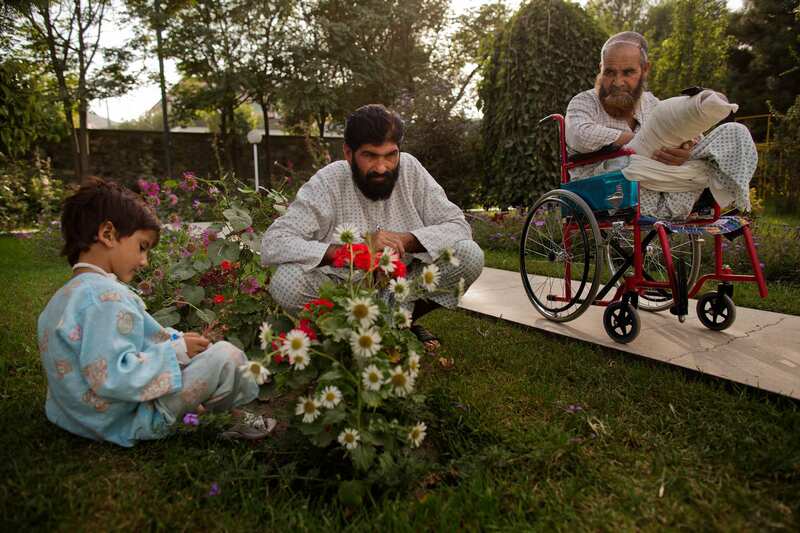 In this achingly dry country, grass and trees and flowers are a prized aspect of routine Afghan life — even more so among the wounded, who arrive on crutches and in wheelchairs to mingle among the roses. 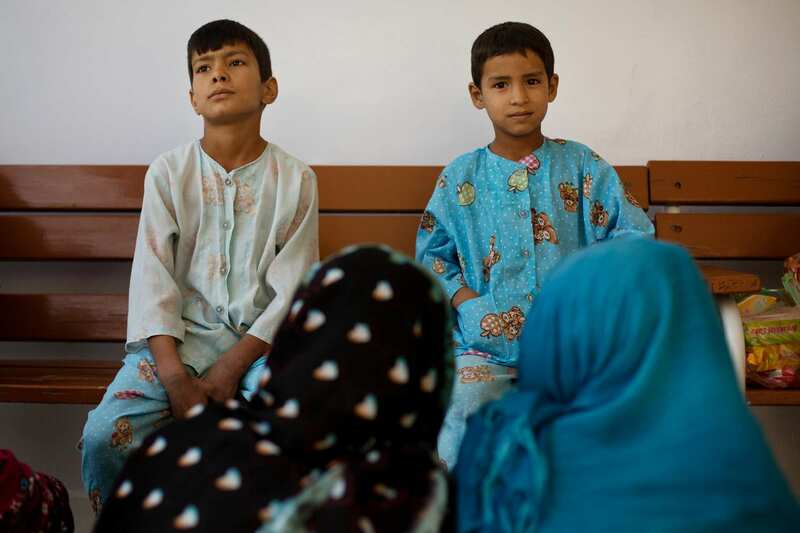 One day in late September, two boys were rushed in: Jan Mohammad, 10, and his brother, Mirwais, 8. 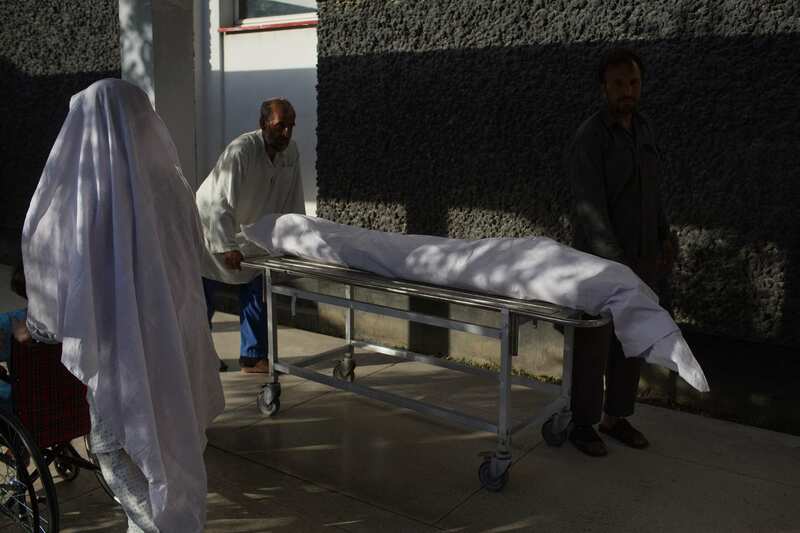 They’d come across an unexploded munition while playing near their home in the Mohammed Agha District of Logar Province and it detonated. 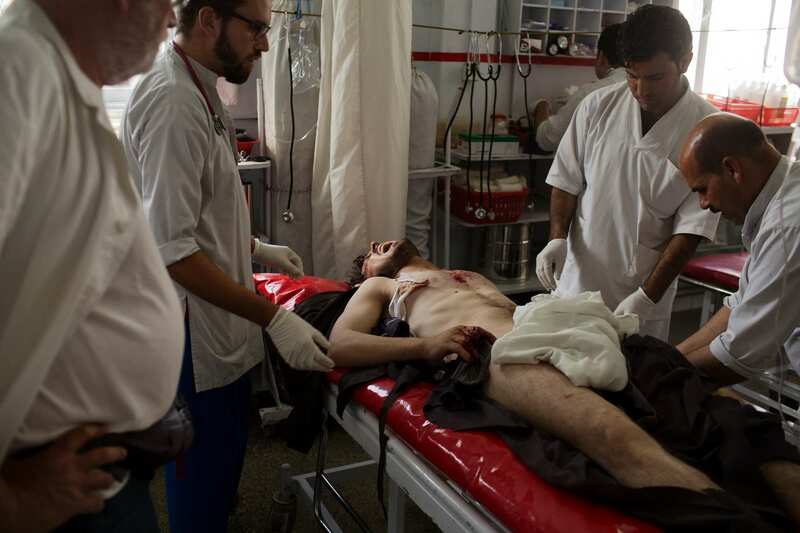 Mirwais’ wounds were bad, but not life-threatening. But Jan Mohammad was in grave shape. His abdomen had been blown open, and now his small intestine rested on his belly. The staff taped a huge pice of gauze over the wound and wheeled him into the operating room, where Dr. Abdul Shokour Sardar scrubbed in. 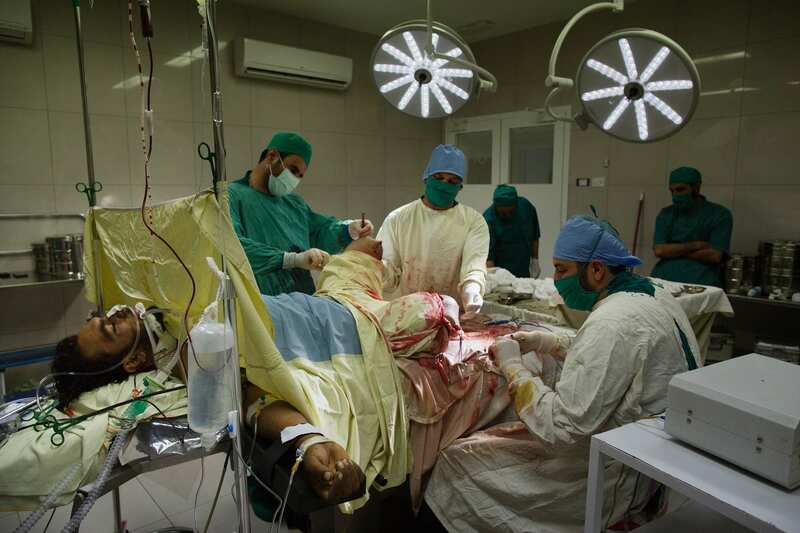 “I’m proud that I’m doing a job for my countrymen,” Afghan surgeon Abdul Shokour Sardar said. 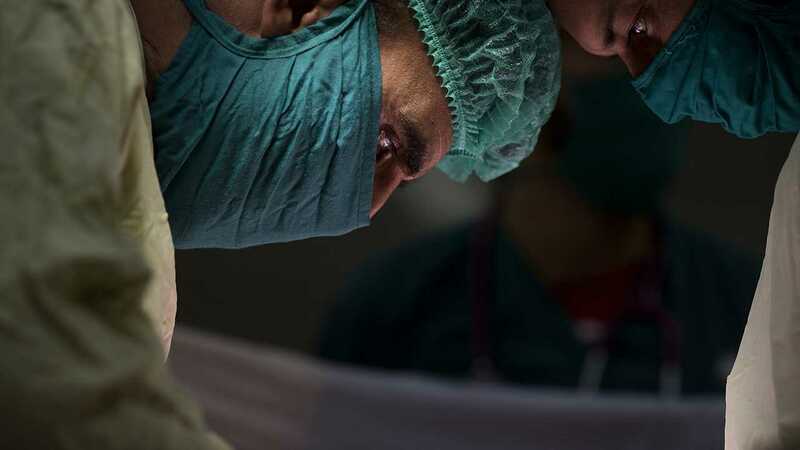 Shokour, 42, a 12-year veteran of Emergency and one of the world’s most experienced trauma surgeons, opened the boy’s abdomen. He tried and failed to clamp a gushing artery. While vacuums sucked blood from the boy’s gaping wound, the doctor grabbed a scalpel and sliced into the boy’s thigh, cutting out an inch-long piece of vein for a vascular graft. 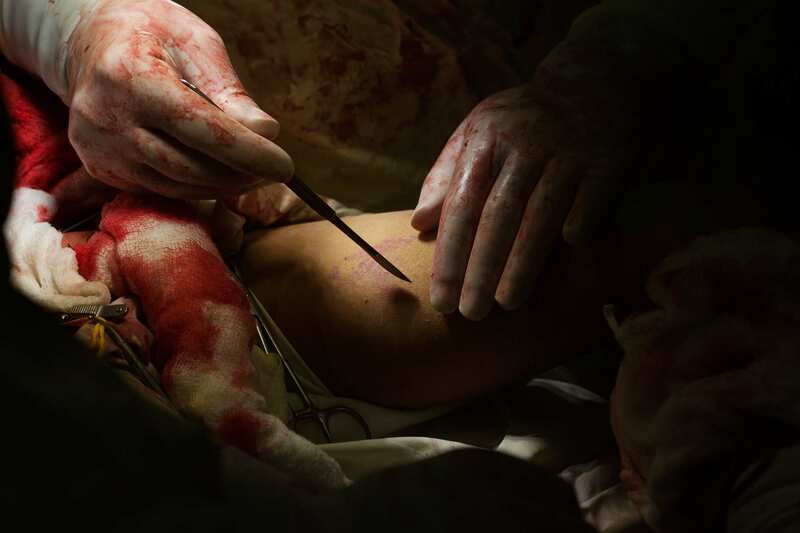 He stitched the leg, then sewed the piece of vein into the abdomen. 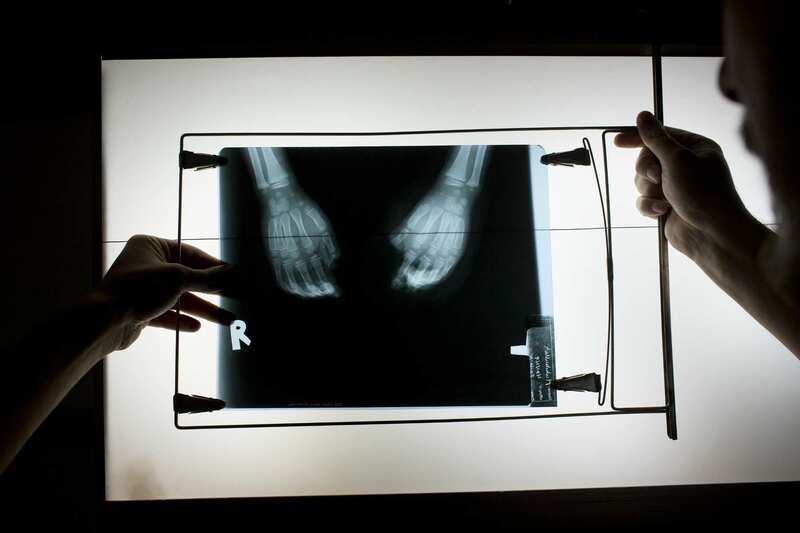 Dr. Abdul Shokour Sardar holds up an x-ray for Mamim Ali, center, during morning rounds. Days later, Jan Mohammad and his brother would be able to stand and walk from their beds in a recovery room, surrounding by family and other wounded children, and sit outside in the warm fall air to call their mother from a cell phone. 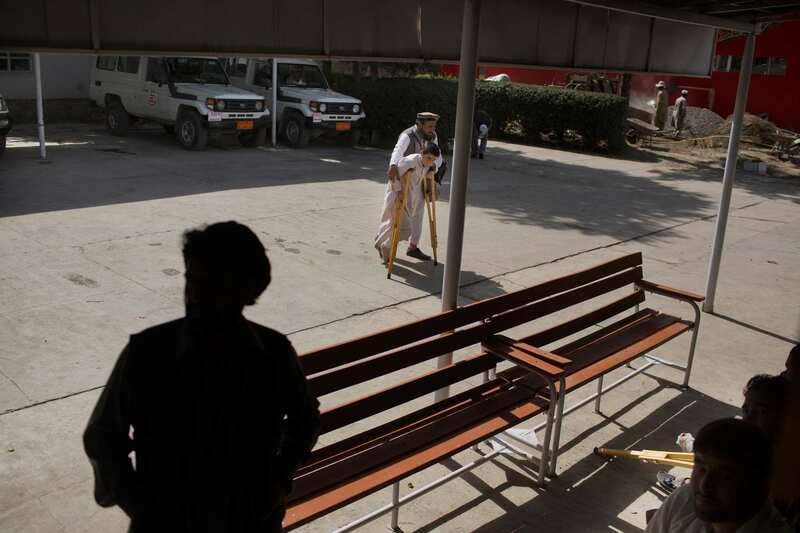 On Oct. 3, two children, injured in what the U.S. said was an American gunship’s accidental bombing of a Doctors Without Borders hospital in Kunduz, were wheeled into the emergency room after a 12-hour journey by helicopter and station wagon. 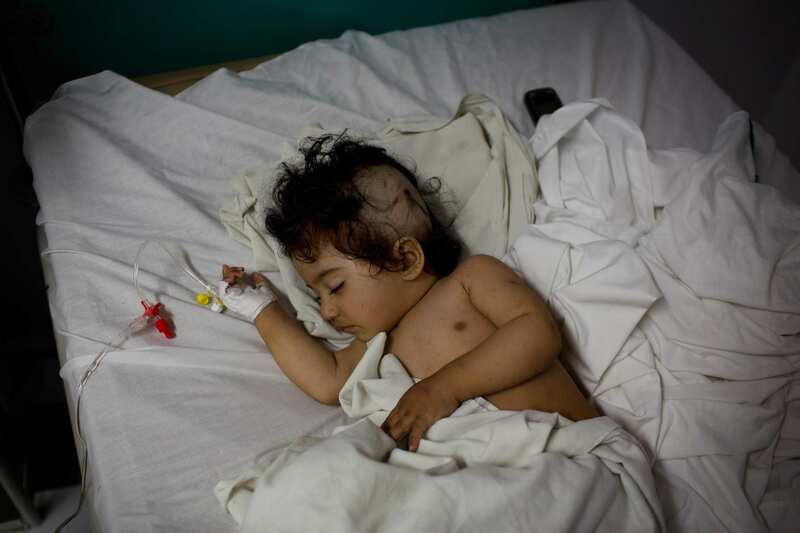 One, a 4-year-old boy named Wahidullah with a shell injury to his back and abdomen, cried softly. The other, Madina, 8, screamed. Shrapnel had shredded one of her legs and shattered an arm. She wouldn’t let anyone take off a splint to examine her wounds. Her eyes were wide open, terrified. 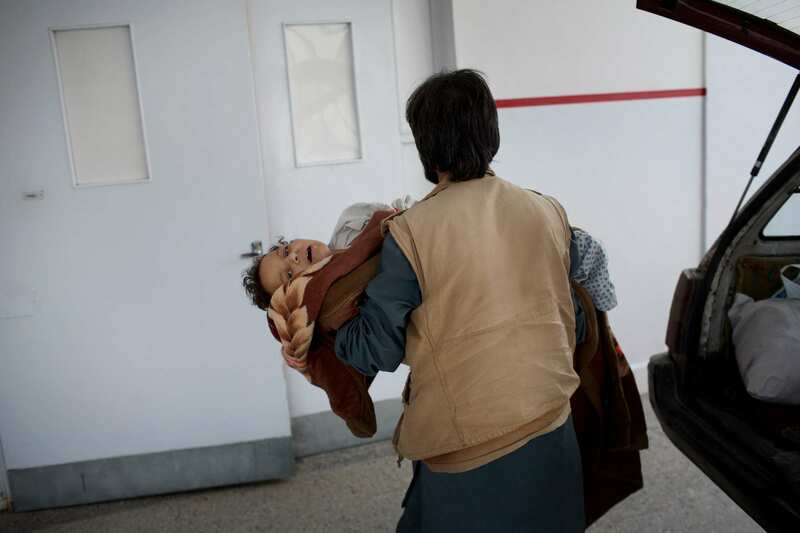 A relative carries Madina, 8, into the emergency room at Emergency. 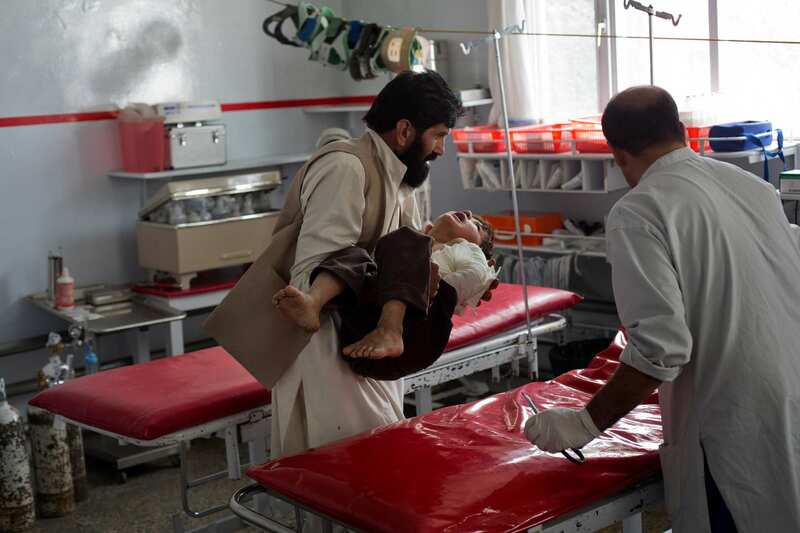 The girl survived the night at a Doctors Without Borders hospital in the northern Afghan city of Kunduz that was hit in a U.S. airstrike, killing at least 9 staff members and an unclear number of patients. 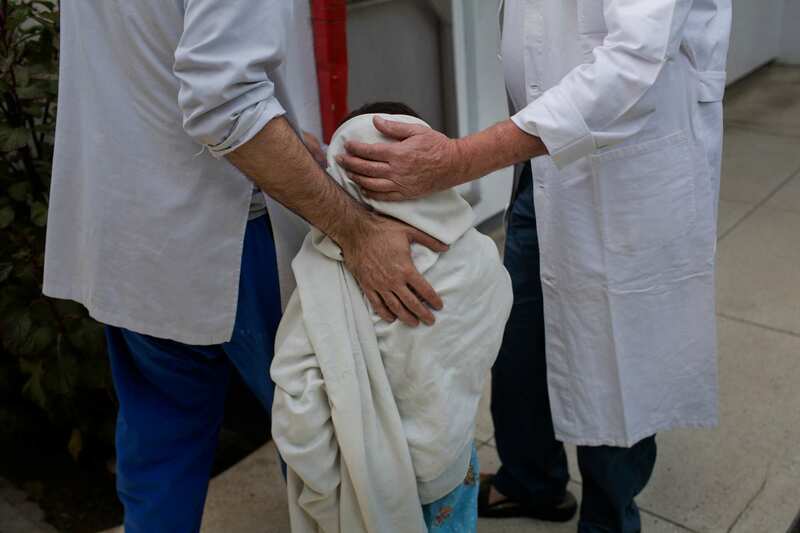 Madina, 8, is comforted by nurse Giorgia Novello in the emergency room October 3, 2015. 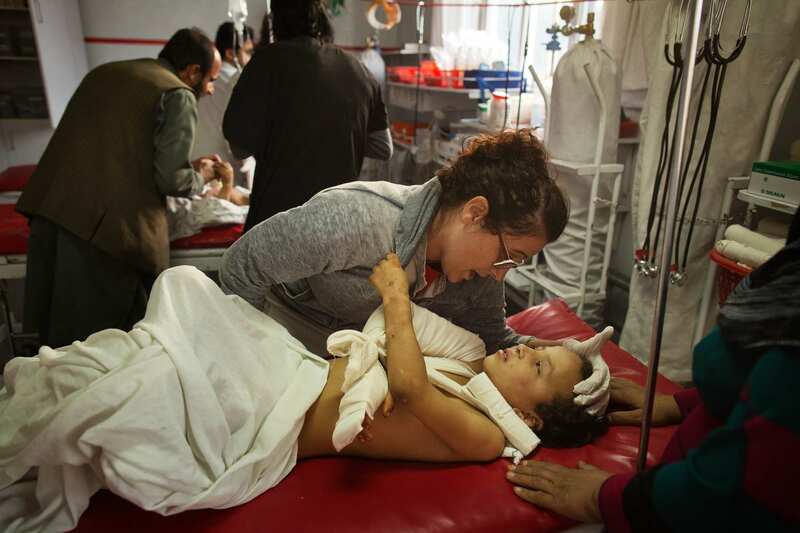 The girl and her mother arrived at Emergency hospital after surviving the night at the Doctors Without Borders hospital in the northern Afghan city of Kunduz that was hit in a U.S. airstrike. As if under a spell, the girl relaxed. She gripped Novello’s hoodie and her wailing stopped. Both kids went into surgery. They survived. The doctors and nurses of Emergency live a strange, cloistered life. Because of concerns about security and anything that could compromise the group’s neutrality, the Emergency staffers rarely socialize outside their own compound. They live together, cook, and relax in a communal house, and only travel between it and the hospital for the duration of their tours, which range from six months to years. Those on long contracts sometimes take breaks outside the country. They generally have little idea what’s going on in the rest of Afghanistan, but they see the conflict as intimately as anyone. Surgical instruments rest on a table as doctors work to amputate the legs of Gula Jan. 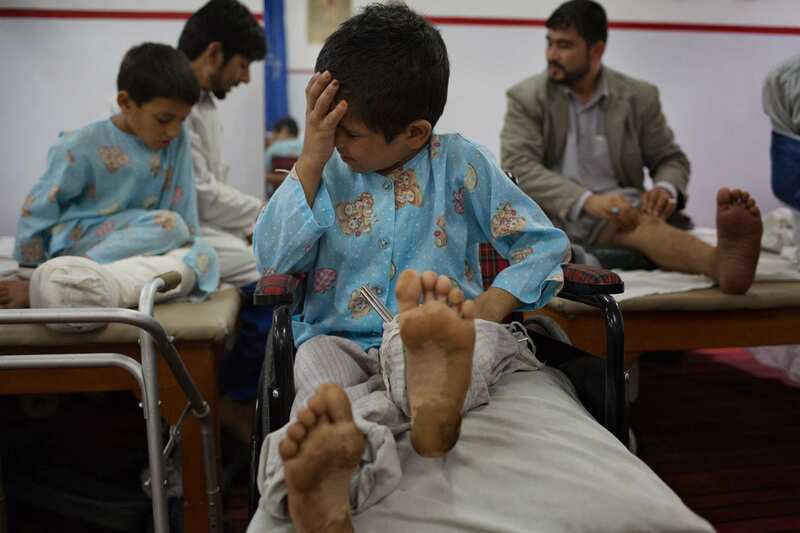 Emergency Kabul occupies a former school that was bombed in 1992. 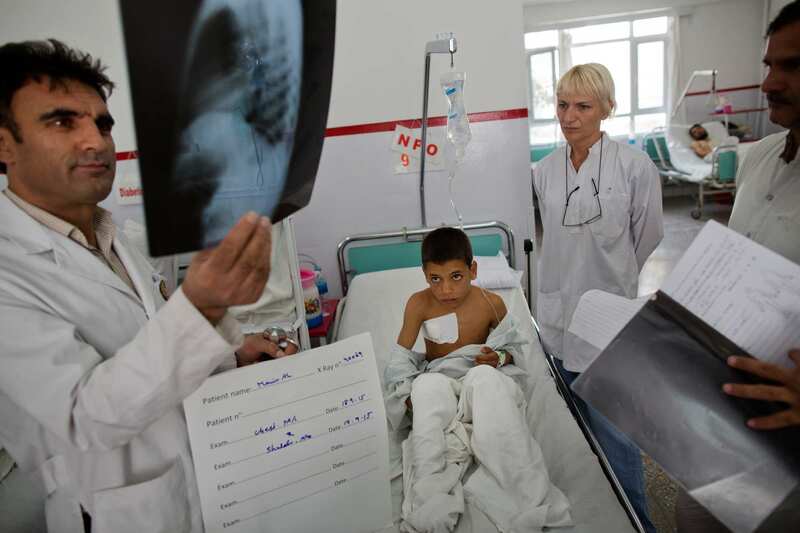 In 2000, during the Taliban’s rule, Emergency persuaded them to convert the building into a hospital. The facility opened the following year, and has grown steadily. Emergency has just completed an expansion that included three new operating theaters, a new intensive care unit and several new beds. The plan is to someday leave the center to the Afghans, who will run it themselves. 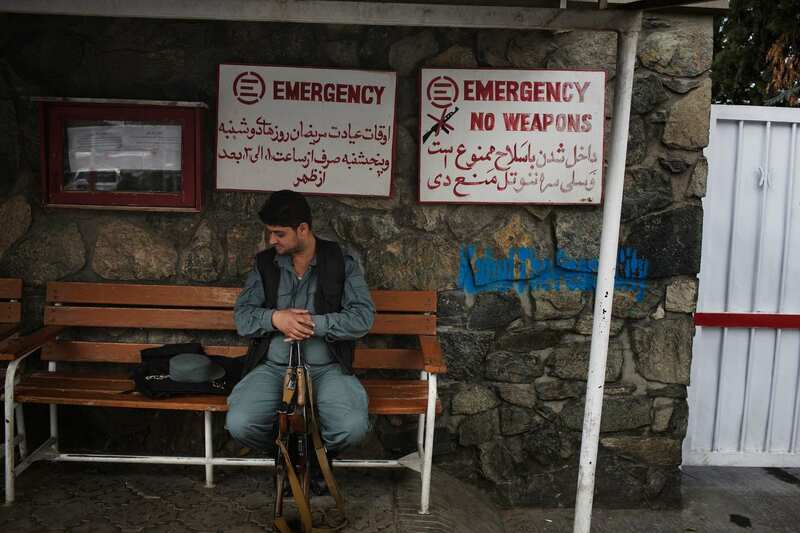 A member of the Afghan National Police waits for a colleague with their weapons outside of Emergency Surgical Center.The facility observes a strict no weapons policy inside. 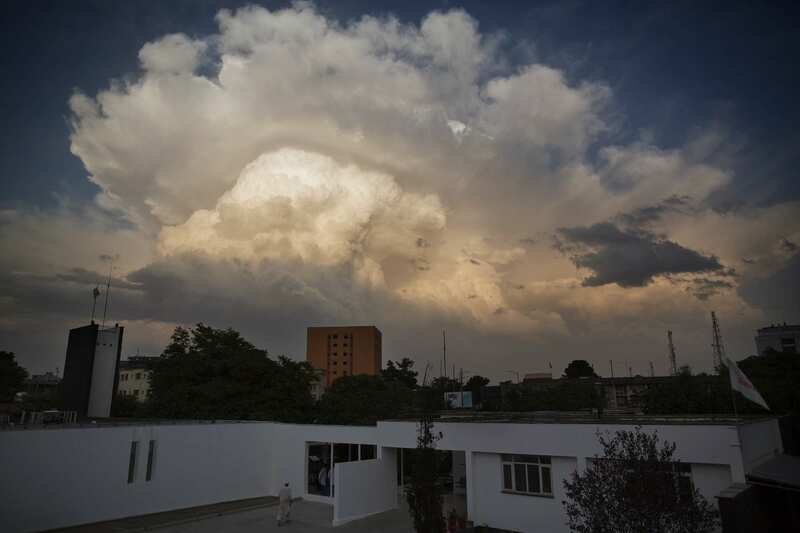 The Kabul facility is part of Emergency’s growing network in Afghanistan, which includes two other hospitals, more than three dozen clinics and first-aid posts and an expanded maternity ward in the northern Panjshir Valley. “Remember, it’s more dangerous in Afghanistan to be a mother than a soldier,” Program Director Luca Radaelli, 39, said. There were so many women at the Kabul center last fall that it was running out of room for children. One day in late September, Maryam, 22 and seven months pregnant, sat up in her bed, head covered in white cloth with a metal armature bolted to her face. 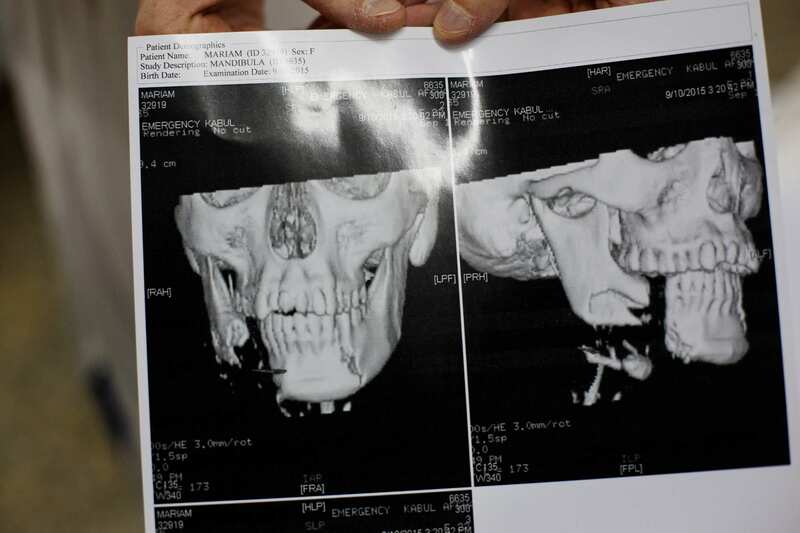 Hayzelden, a Brit who was nearing the end of a six-month tour, picked up an X-ray that showed Maryam’s jaw, shattered when she inadvertently found herself in the middle of a gunfight in Ghazni. Surgeons had pieced the bone back together, and inserted the armature to keep the fragments in place. She was in good spirits; her unborn baby was okay. 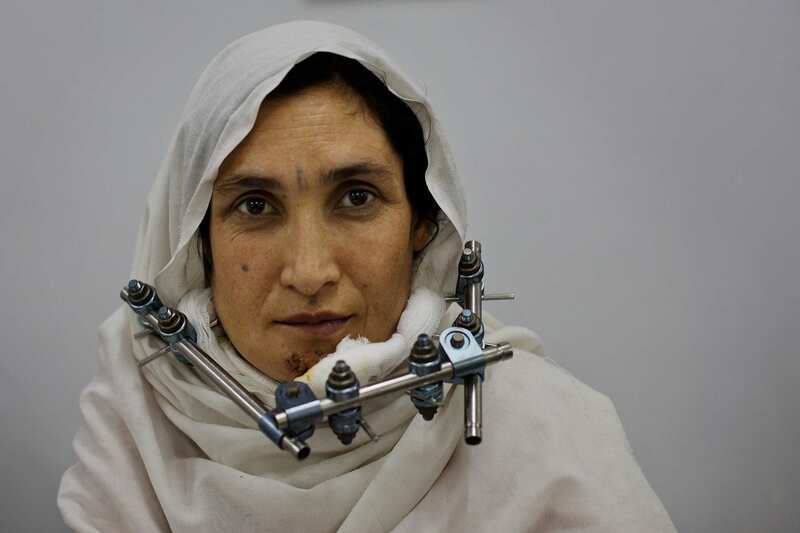 Injuries to women are also on the rise in Afghanistan. Stay in the center long enough and the patients and stories begin to overlap. People arrive on the edge of death and not long after are sitting up in bed, eating beans and drinking apple juice. Then, one day, their beds are empty, and they’ve moved on, healed. Victims arrive by ambulance and taxi, carried by family into the hospital, where surgery quickly begins. The patients, caught in circumstances beyond their control, quickly try to resume ordinary daily activities. They include Gula Jan, 35, a farmer who drove a tractor over an IED and lost his legs and days later could be found scarfing his bedside dinner. 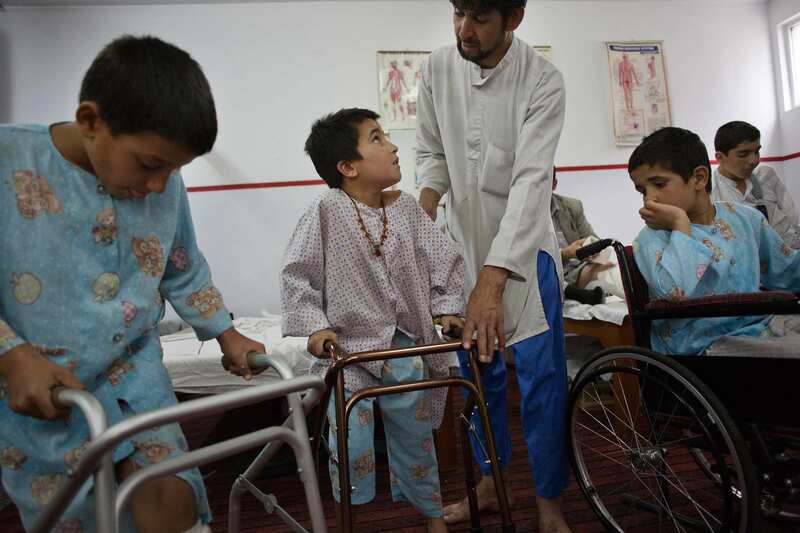 And 10-year-old Hakim Jan, left leg destroyed by a rocket-propelled grenade, who playfully scammed nurses for extra cups of juice. 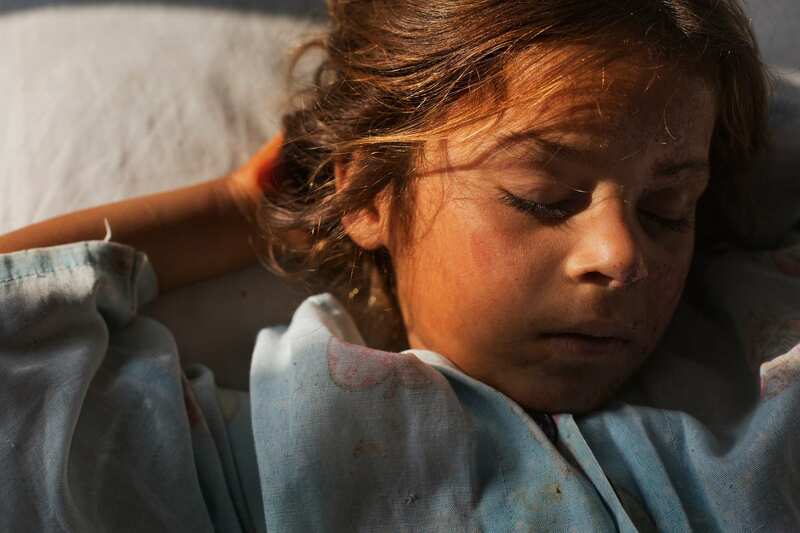 And Yasmeen, 5, burned in a bomb blast that killed her parents, napping with her arms propped behind her head, as if she were floating on a raft. 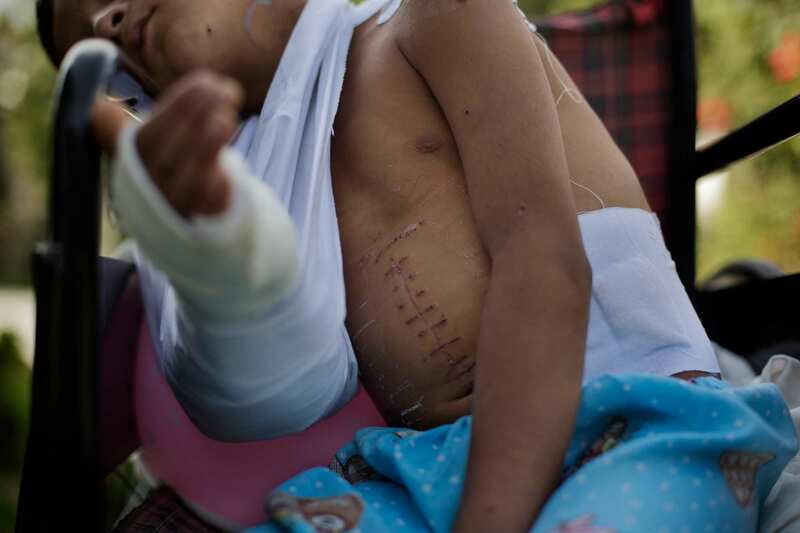 Rehabilitation of shattered bodies is slow and painful, particularly for the children. Some, of course, do not make it. Mohibullah, 5, arrived with spinal injury inflicted by a mortar round and died soon afterward of cardiac arrest. 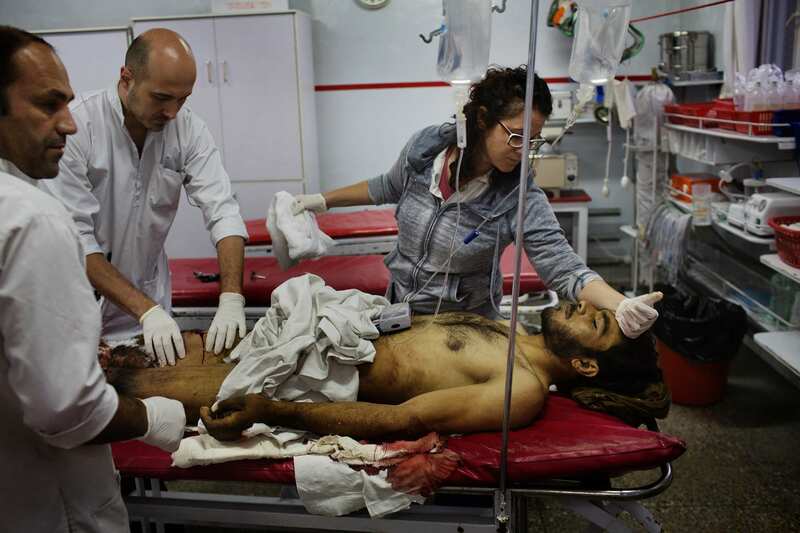 He’d lain next to Shafiullah, 18, shot through his temple, who lived two days longer. At night, in rare times of quiet, the nurses talked about the war. The Taliban had opened new fronts across the north and south of Kabul, movements that appeared to put the capital in a tightening vice. Hayzelden said that her time with Emergency taught her how to save people’s lives with limited resources. But she said she worried about the care her patients would encounter after leaving. 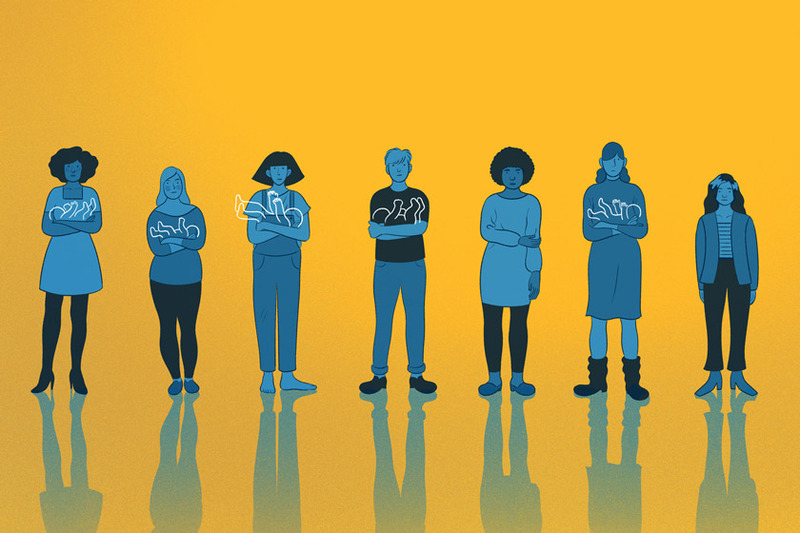 She and others point out that the real cost of maimed children, incapacitated adults and the nation’s collective trauma is impossible to measure or predict. 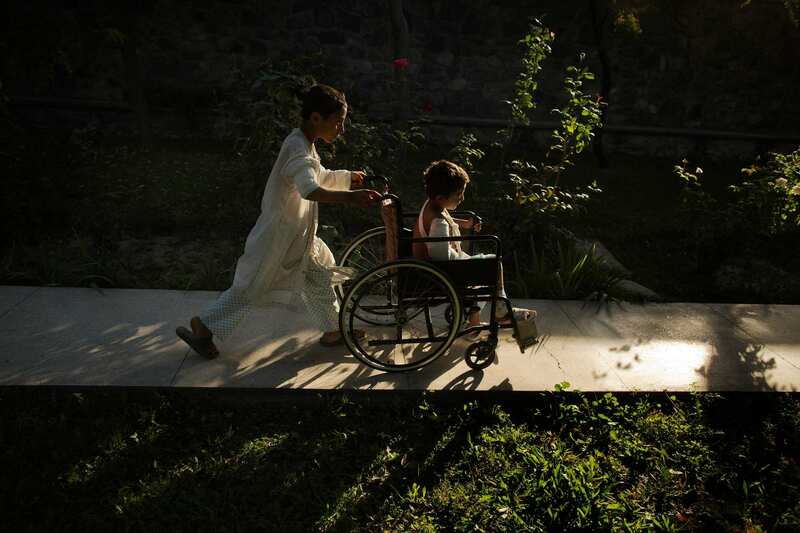 Ajmal, 11, pushes Sangeer, 7, through the garden at Emergency Surgical Center. 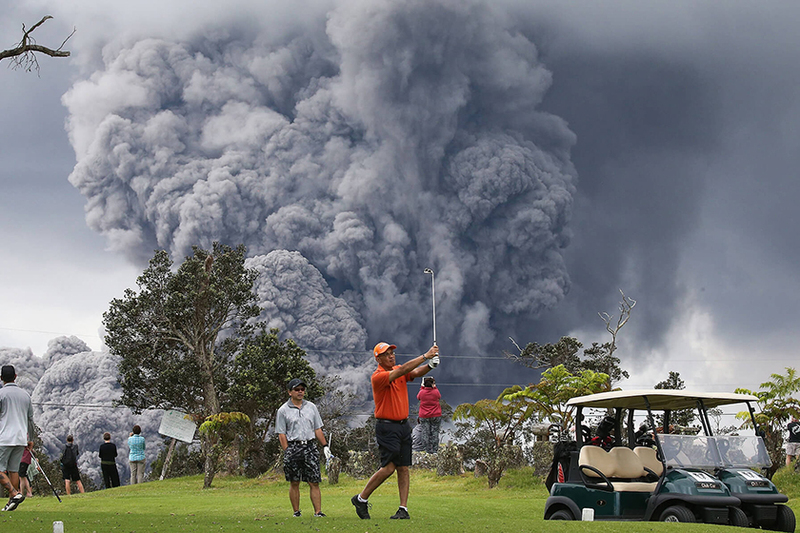 From an unexpected hurricane and deadly wildfires to migrants flocking to the U.S. border, 2018 was full of big stories with powerful images to accompany them. 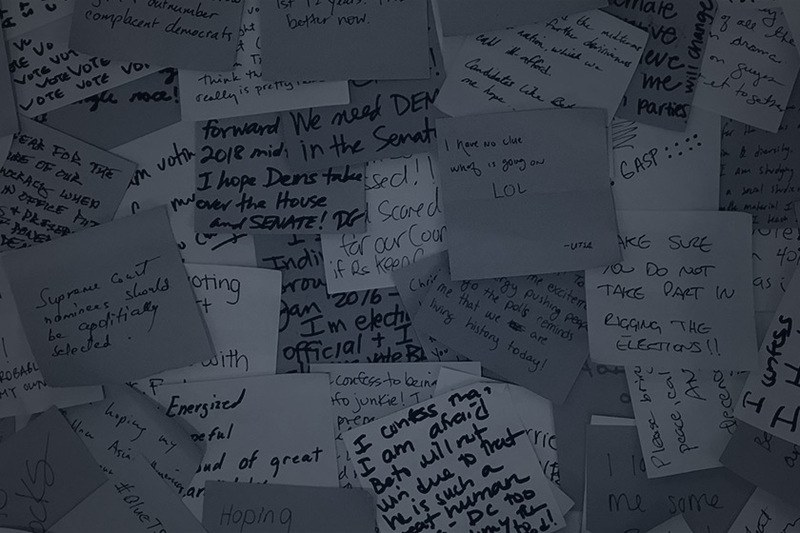 Your deepest, darkest secrets about the midterm elections.